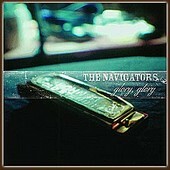 Pop songs with a roots touch, The Navigators'Glory, Glory, a six-song EP, borrows the best aspects from pop-rock, Americana, and folk, to create a unique sound that is as timeless as its influences, and as modern, too. Opener "One Line Epitaph" showcases The Navigators' ability to create gentle, laid-back folk-pop, while "I See You Clearly" is roots-rock with a helping of pop influences. Then there is "The River", a tender, acoustic pop song that tells a story and wraps you in its warmth. But the album standout is "Bow", an old-time country-infused number, the banjo as important as the vocals, that bridges the gap between the old and the new, both things that seem to feed The Navigators. Calm and soothing, like sitting in your backyard, with just a few friends, playing guitar and drinking whiskey and beer, The Navigators' easy-going style is as friendly and inviting. Glory, Glory is a triumphant mixture of the styles that make The Navigators who they are, with enough of The Navigators' own style to make it refreshing. I'll give it a B+.